Despite of increased interest in metal industry, mining and metal companies are exposed to higher business risk that other business sectors. However, the process of accepting and actively managing risk can add significant value to a business. 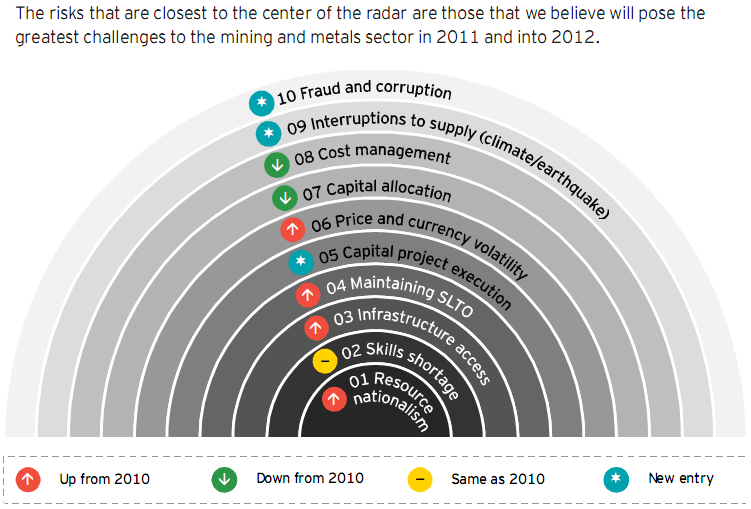 The Ernst and Young has created Business risks facing mining and metals at 2011-2012. Before we continue on business risk at 2011-2012, we’d better understand top ten global business risk at 2010. Compared to business risks at 2010, it is confirmed much change in business risks rated at 2011. Figure below depicts The Ernst & Young business risks radar at 2011-2012. Resource nationalism is the biggest risk in 2011 and 2012. Government of Indonesia has issued Law number 4 of 2009 concerning mineral and mining industry. The law has provided direction for the mining and mineral industry. In article 102, it is stated that the owners of operation mining permit and special mining permit are obliged to increase the mineral and/or coal added value in mining, processing, and purifying, and also the utilization of minerals and coal. THE PROBLEM is there is no technology currently exists for profitably upgrading coal on such a large scale. Again, maintaining social licence to operation is also a big concern (as I already wrote here). Maintaining social license to operate become more significant in 2011-2012 than in 2010. One current example just happened in Indonesia : land dispute. Obtaining a social license can sometimes be difficult when land disputes arise between mining and metal companies and local communities. To respond to this risk, mineral and mining companies should encouraging and engaging in community or employee debate over sustainability priorities. The business risk report mining and metals 2011-2012, The Ernst&Young.